A few years ago the sugar cane industry offered lifetime pensions to anyone who saved more than 350 paystubs during their working lives. Here, Chi Chi proudly shows some of the paystubs he saved. 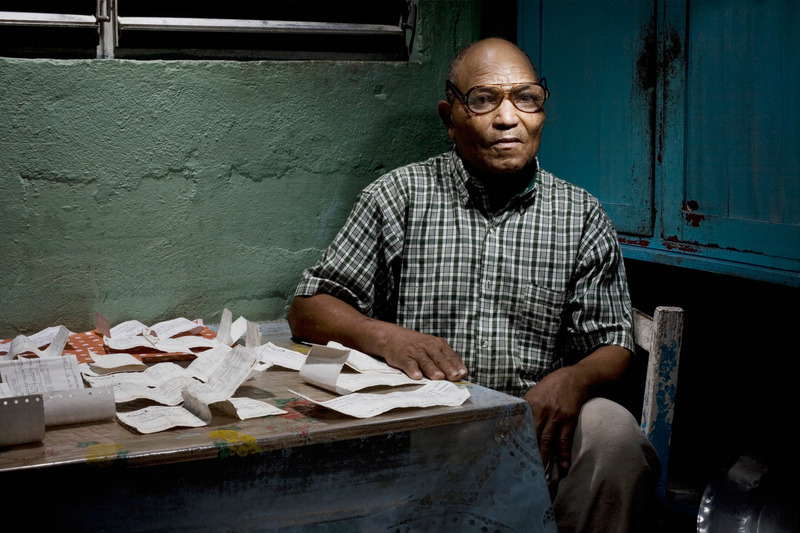 He was the only person in the Batey to have saved more than 350 paystubs, which earned him and his wife Sonia a monthly pension of 2,985 pesos. Yoni moved from Haiti to Las Pajas four years ago. His cousin helped him become a citizen after 2 years. If someone asks him if he is Haitian or Dominican, Yoni responds, "Soy legal" (I'm legal). He cuts sugar cane, earning about 300 pesos ($8) every two days. Yoni is also the proud new father of a two-month-old son. Berto "Papa" and his sister, Marciel "Cyclone" grew up with a back yard full of sugar cane. Marciel is appropriately known throughout the Batey as Cyclone because her mother gave birth to her, soaking wet, on the day of Hurricane George. George swept through Las Pajas on September 22, 1998, flattening all homes built out of wood and scrap metal and leaving only some of the barracks standing. Altagracia, "Ta Ta", lives in this house with two of her three children. When she was 4, she had a high fever that paralyzed the left side of her body. Three years ago she joined a Christian church for the sole reason of being provided free rice every week for her family. Felicia raises three of her grandchildren. The family was supported by her husband's pension until three months ago when he passed away. She lives in one of the few barracks that survived Hurricane George. She believes that the Lord will sustain her during this difficult time in her life. For the last three months Chito has been working in the fields chopping down sugarcane. If he fills a truck, his boss Hector pays him about 500 pesos (15 US$) for two days of work. The sugar cane season, which is known as “Zafra,” lasts four months. Although Chito considers himself lucky to have work in the community, he has always wanted a steady job. Aida Valdez, 6-years-old, looks at her two-month-old cousin Samuel, who was born three months prematurely but is now a healthy, growing "hombrecito" (little man). In Las Pajas, mosquito nets are considered a luxury that few can afford. But the nets are vital in controlling outbreaks of Malaria and the infamous Dengue Fever. Gris, 9-years-old, is one of the many children in Las Pajas without a birth certificate. Her mother was born in Haiti and although Gris was born in the Dominican Republic, she is not considered a legal citizen. Gris cannot go to school past the 8th grade without a Dominican birth certificate. More and more organizations are currently working with Bateys to find ways of getting Haitian children legal Dominican status. Dato and his wife were born in Haiti. In 1970, he came to cut sugar cane in the Dominican Republic. Shortly after, he sent a gua-gua to bring his wife to join him in the new, prosperous country. They have been married for more than 50 years and now live with their 6-year-old grand child. Since retiring from cutting sugar cane, Dato weaves baskets that he sells in San Pedro de Macoris for 250 pesos each. At 23, Litalina is the mother of three children. Giro, her youngest, is 1 year old. Every three months, Litalina does her friend, Maria Lopez's, hair extensions, which cost Maria 294 pesos, equal to the cost of two weeks’ food for her family. Oscar, 8-years-old, works with his father in the fields every day tending to their animals. Their five goats, two cows, two horses and five chickens serve as a form of insurance. This horse, valued at 4,000 pesos ($120), would only be sold in the case of a family emergency. Oscar’s mother runs a community store, which provides the family’s modest income. Hurricane George pushed Maria and her family out of the barracks, and she moved into this wooden house. When she relocated, Maria bought the painting behind her for 300 pesos. Maria’s greatest pride isn’t the painting itself but rather, the frame it’s in. Hector is the highest paid resident in Las Pajas. Safra or no safra, he is paid 11,700 pesos monthly. He is the superintendent of the sugar cane fields and lives in one of the few brick houses in the Batey. This government-owned home is more than 100 years old and has been lived in by superintendents for its entire existence. Yani “Nancy” Ortiz lives in this house with her husband and their three children, ages 2, 5 and 10. They've lived here for six years, and they gave it a fresh coat of Limoncillo paint in December. The Bateys were intended to be seasonal towns. But in the last 40 years, the Dominican Republic has become a symbol of hope and prosperity for the Haitians. Because of this, more and more Haitians have discontinued going back to Haiti after the season and have started families in the Bateys. In theory, this sounds ideal. But the infrastructure for a permanent population remains unmet in the Bateys. The schools have little to no funding; there’s no running water or plumbing; and trash collection is obsolete. Another problem plaguing these small communities is the lack of legal documentation of citizenship. Without the basic rights as a citizen, most of these people are denied education and healthcare. This has created significant social status issues, which will only improve with the help of humanitarian organizations. At the time I took these pictures, my friend Rachel Gottesman lived in this small Batey called Las Pajas. Rachel invited me to stay with her for a few days, and it was an eye-opening, unbelievable experience. Even though the problems plaguing the Bateys are similar, each person had a unique story to tell. In the end, I was the biggest beneficiary of all. I was honored to learn about their lives. Despite having nothing but each other, they’re more content than most people I meet in the more developed world. I also discovered that money alone isn’t the solution to helping impoverished people. What they need more is education, healthcare and correct nutrition. I was struck by how these Haitian people view themselves as extraordinarily lucky compared with their families back home. Although the conditions of the Bateys are deplorable, they’re nothing compared to those that exist in Haiti where the current food crisis affects 60 percent of the country’s people. Who would think that people with no education, no access to healthcare and terrible sanitary conditions would consider themselves lucky? These are the lucky Haitians.